We specialise in Residential/Commercial Mortgages and also provide Lettings and Sales. We also arrange RICS valuations for bank loans and independent Valuations. 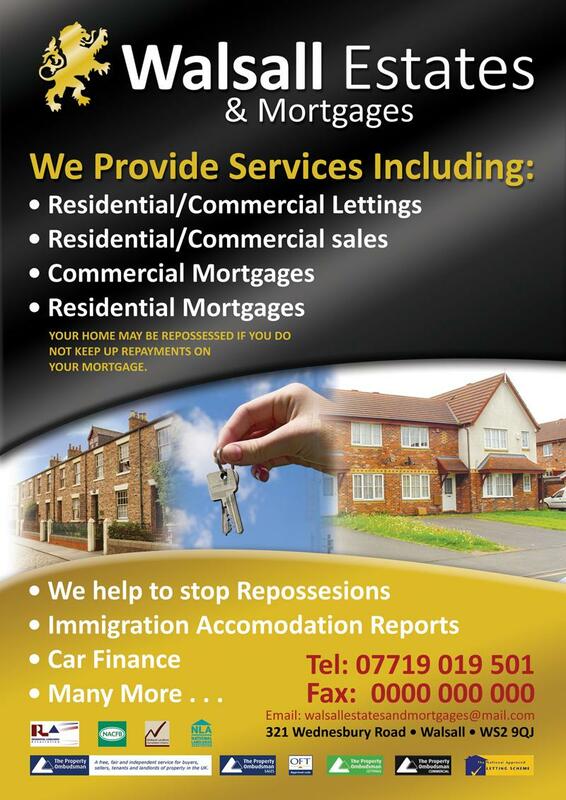 We sell repossession properties via our stock which we receive direct from Lenders and private Equity Firms. We have several staff, Valuer, Mortgage Advisor and a Solicitor to hand. Several membership affiliated. Please see advert in Walsall Advertiser. We cover the Walsall region and Wolverhampton region. We charge 10% plus vat to manage properties and we charge 1.5% on commercial mortgages. Other services please enquire via email.